You are here: Home / Blog / NFL / C.J. Mosley Didn’t Think He Could Play In The Pro Bowl. Guess Why? C.J. Mosley Didn’t Think He Could Play In The Pro Bowl. Guess Why? December 24, 2014 By Nick A. A few days ago, the NFL announced the players who were selected to this year’s Pro Bowl. Many players waited the entire season for that announcement, but it looks like maybe one player wasn’t even thinking about it at all. C.J. 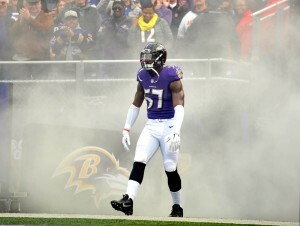 Mosley, the rookie linebacker for the Baltimore Ravens, seemed to have cared less when the lineups were announced. Not because he’s soley focused on winning a championship or he doesn’t care about individual accomplishments. Nope. Not those reasons at all. The reason: He didn’t think rookies were allowed to play in the Pro Bowl. Yes, that was his real answer. From what I heard, Mosley is a pretty intelligent player, and I’m kind of surprised that that was his response. I’m not sure if he felt that the NFL was similar to a high school football team in a way where freshman could not start on varsity, but I’m sure he had his reasons for thinking the way he did. Although his reasoning may be a bit embarrassing, I bet Mosley would rather be embarrassed for five minutes instead of not playing in the Pro Bowl.